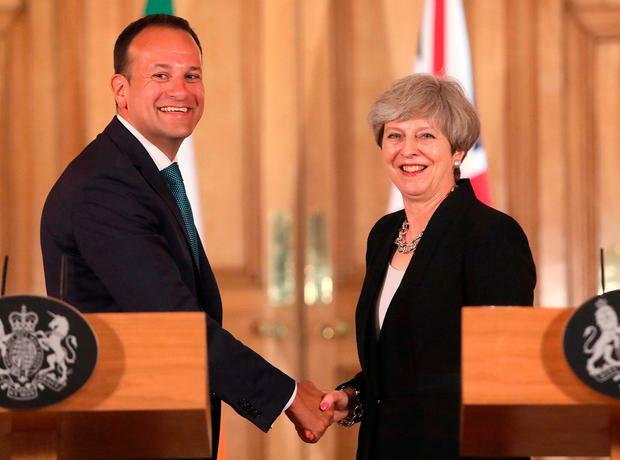 British Prime Minister Theresa May last night outlined a "fair" deal to reassure EU citizens about their status post-Brexit, as Taoiseach Leo Varadkar sought to highlight Ireland's case at his first EU summit. She told EU leaders that citizens with five years' residence would be treated the same as UK citizens for healthcare, education, benefits and pensions, echoing EU demands. There will be a grace period of up to two years for people to settle their status after Brexit, with a "streamlined" application procedure. She will detail the proposals in a paper to be published next week. Irish people's rights are covered by the common travel area with the UK. Meanwhile, Mr Varadkar met with EU summit chair Donald Tusk, European Commission President Jean-Claude Juncker and German Chancellor Angela Merkel to press Ireland's position in the talks. "Our objective is a very clear one and it's a very simple one: that there should not be an economic border between Northern Ireland and the Republic of Ireland," Mr Varadkar said. "Just as the British may have their view as to how Brexit should take shape, we have ours, and we want to retain the normal trading relationships that have existed on our island and between our two islands now for many decades." "We don't want them to leave the European Union, we don't want them to leave the single market and we don't want them to leave the customs union either. That is ultimately a decision for them, however, and that may change," Mr Varadkar said. Mr Tusk was also entertaining the notion of a Brexit reversal, quoting John Lennon's 'Imagine' when asked whether it was a possibility. "You may say I'm a dreamer but I'm not the only one." But Belgian Prime Minister Charles Michel twisted the lyrics to dismiss the idea. "I am not a dreamer, and I am not the only one," he said. Exactly a year on from the UK referendum, Brexit talks have only just begun, with the EU prioritising citizens' rights, a financial settlement with the UK, and the Irish Border. "It's also about how we will build a future special and deep partnership with our friends and allies in Europe," Mrs May said yesterday. But the Taoiseach said it was more important to get "a good deal for Ireland in time than one that doesn't work for us in a shorter time period".